In the beginning of December I’ve been asked to write a review of a book called CakePHP Application Development. The interesting thing was that I received a copy of the book exactly on my birthday – 29-th of December (probably consequence, but it was really nice). In this article I will write about what this book covers and my opinion of the content. Hope it will be a good guide for these of you who will decide to buy a copy of it from Amazon.com. First two chapters start with some theoretical explanations about concepts and patterns which are used in the Framework as well as the process of installation of the framework. The next chapter explain how to build a really simple application. The readers could use to with the framework way of coding, everything in this chapter is hand crafted, so people could actually see how it’s works. After this there are 4 chapters which explain in details how the Models, Controllers and Views are working in details. There is one chapter which explain how to build an scaffolded application with the Bake console script. There is an explanation how to create Models, Controllers and Views. The next chapters explain how to build a real world example with CakePHP called Quickwall (Questions and Answers), which is different from standard blog creation example. In these chapters the authors upgrade and optimize the app and expand it’s functionality, so at the end it could be used in the real world. Using non trivial building a blog is also a plus, I personally don’t think that anyone will write a new blog platform, just because for fun. The Quickwall application could be used in real world without any problems. There are some things which are missing although they are well known – the behaviors. The same as the authors explained about the components and helpers, they should take a moment and explain the behaviors as well. In fact this is totally missing in this book. Although the validations are well explained in the book, I miss the list of methods provided from the core. There isn’t any information about the internationalization, which for me as developer working with many people and different languages is essential. I would recommend this book for PHP developers who are new to the framework and they are willing to understand the core functionality of it. With the good approach of introduction-code-explanation, it will be really easy to learn how to use the CakePHP. This book could build a base, but it cannot create from you an advanced CakePHP developer (well I think it’s not the main purpose of it anyway). The learning is ongoing process and people which are willing to learn could start with this book, but after this, they need to continue reading other materials, as well as start with real development tasks, because the practice is the best teacher invented ever. 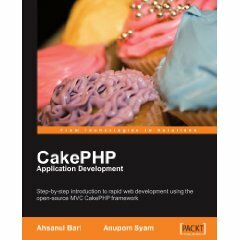 This entry was posted in CakePHP, General and tagged Book, CakePHP, Review on January 12, 2009 by Nik Chankov.